From the rugged mines of the land down under comes the world's finest example of a gem so dazzling and unique that it's capable of expressing every color in the visible spectrum - the Australian opal. Now, the ever-changing beauty of this treasured gem can be yours in the Opulence Pendant Necklace, a fine jewelry design exclusively from The Bradford Exchange. 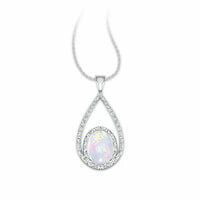 This stunning Australian opal and genuine diamond necklace is handcrafted of solid sterling silver and features a magnificent oval-shaped Australian opal at its center.The exquisite double loop design creates an endless sparkle surrounding the opal. The fashionable teardrop shape of this Australian opal and diamond pendant gleams with a pave of genuine diamonds and features an inner loop surrounding the Australian opal with even more diamonds - 12 diamonds in all!-! Your Opulence Pendant Necklace arrives with a matching 18" sterling silver chain in a velvet jewelry pouch and gift box. Strong demand is expected. Order now!